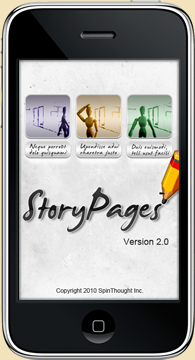 One more iPhone app SpinThought® StoryPages for iPhone users that gives anyone opportunity to create illustrated stories or guides of any kind and deliver them quickly and easily. According to the Spinthought, StoryPages is as much attracting for the users as it lets the users create storyboard style pages with your drawing in a top panel and typed text in a bottom panel like a storyboard used during movie production. Besides drawing in fullscreen (landscape or portrait) and optionally adding a background, StoryPages can be used for sketching movie scenes, animations, and comics. In case one is lack of some papers or other tools to take notes, with Spinthought it is available to keep a record of product ideas, visual instructions, help files, construction and restoration projects, teacher curriculum, travelogues, hobbies, dream recording and more. This new IPAD VERSION will be available at the grand opening of the new IPAD only app stores.